As mentioned before, the lead acid batteries that power the house has seen better days. 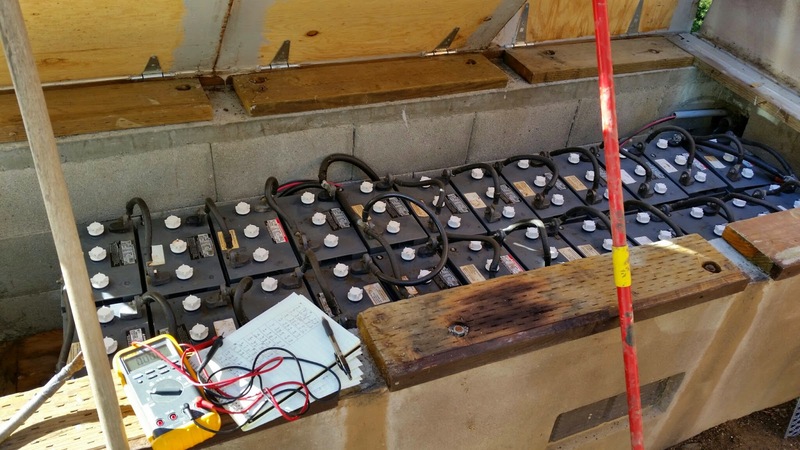 The batteries being used are 24 6V batteries, wired in 3 parallel strings of 8 batteries with system voltage of 48V. I was not able to read any direct model numbers off the batteries, but they probably have rated capacity of 300~350Ahr. The actual capacity at time point is probably significantly lower, though. Below is the actual wiring diagram of how the system was originally wired up. The three parallel strings are made up of batteries 5~12, 17~24, and 1~4,13~16. Due to the physical sizing of the battery box and the fact that these are 6V batteries, something had to give, and in this case, it was how the three parallel strings are wired up. Best practices for battery sizing seems to guide people to minimize parallel strings to reduce possibility of imbalance. In fact, the ideal battery configuration seems to be 2V x 24 (or however you may need for target system voltage) or just one series string of batteries. All I've read seems to heavily discourage 2+ parallel strings, and if you end up with a 3+ parallel batteries, not to tie them to each other, but to run similar length wires individually to each parallel string and tie them together at a common point. You can see that the dead or compromised batteries are the ones closest to parallel wiring, where it was likely seeing significant amounts of overcharging and overdrawing during the charge / discharge cycles. The long term solution would be to replace the battery pack with properly designed one, but that has to happen after we had more solar generation capacity - currently, the solar panels are not quite large enough to fully charge up the battery pack even on a sunny summer day. The system voltage is now in the correct range instead of swinging between 45V~47V. Unfortunately I forgot to bring the Bluetooth serial module that I was going to use to read out and store the battery monitor information. Hopefully I'll remember next time I head down!